This was written before the hurricane came through the Keys. We still intend to build and we think the only way to build is with the ICF blocks, described below. Where do you start! If you are scared of hurricanes as we are, we decided on a concrete structure. What type of concrete structure? Poured in place, tilt up panels, concrete block? I was first concerned by the cost. After speaking to contractors and architects I am concerned about what processes are available in the area we are building. Poured in place walls require forms to be used. Who is using forms in the area? Who is familiar with the process? It may not be available in the area we are building. Some contractors know what they know, and nothing else. In a remote area there may be limited choices to what you can get. I have not had any luck with contractors who use tilt-up concrete walls, pre-fabricated walls, or poured-in-place concrete walls either. The typical construction method is to use concrete block, with rebar. Some methods I have heard of call for only the cells with rebar to be filled with concrete. I don’t know if this method is still used or have the building codes been changed to disallow this. The safest method is to use concrete block, rebar and fill all cells with concrete. This makes the structure stronger and heavier. All parts of the structure need to be designed for the additional weight. That makes the price go up. What finish should we use on the outside? I think I prefer a stucco finish. Hopefully waterproof and easily repaired. How do you clean a raw concrete block wall? Do you waterproof the concrete block? What process is used for applying stucco? What color, what texture? I am getting closer to making ICF blocks our choice. They are rigid foam on two sides (similar to Legos) with concrete and rebar added between the walls after the forms are set. The concern I have is that, within a hurricane zone, how do you finish the outside wall? 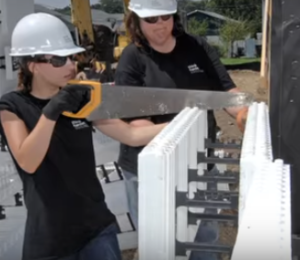 The ICF blocks are lightweight, easy to cut and set up, and have built in insulation. But, the outside facing wall is still foam! How do you finish a foam outside wall? There are finishes that can be used but do they protect the house? If damaged can it be repaired? How do you compare the “R-value” (insulation value) of the different manufacturers’ ICF forms? The “effective R values” aren’t consistently derived from one manufacturer to the next, and are climate-, site-, and project-specific. For comparison purposes between not only ICFs but all wall systems, steady-state R-values should be the prize number, and mass effect considered as a subsequent part of the equation. I have tried to find this number across a few of the major ICF companies online, without success. Concrete block is another choice. It is easy to work with, familiar to most locals, and the labor force does not have to be highly experienced. But, not all concrete blocks are made the same. What PSI strength are they created to meet? In a hurricane area is a higher PSI block necessary, affordable or available? What size block do you use 4” deep, 8” deep? Are all concrete blocks filled with concrete/mortar? ICF forms require it. What type is used? What is the strength? What size of aggregate do you use or is it more of a mortar mix? How do you make sure all cells are filled and worked around the rebar? In an area of high salt content the use of rebar is problematic. Does it sit out in the rain and salt air, and begin to rust? Do you get zinc coated rebar? Zinc will take the corrosion before the steel will. Other coatings? Is it cost effective? 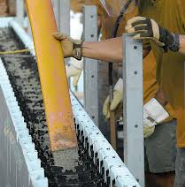 Do you need any coating for rebar within concrete block? Talk to the engineer/architect I guess. For the concrete fill, what PSI do you use? Is using anti-spall additives worthwhile? I read that it is best to treat the steel rebar directly with corroseal, it adds 50+ years for spalling prevention. I hope to install a concrete depression on the edge of the concrete slab so blocks are a little lower than the floors. This is to help prevent wind driven rain from pushing into the interior of the house. You are certainly doing complete and deep research to answer all the questions involved in building your house. I appreciate that. Thanks for keeping everyone in the loop. Extra 50 years, wow, you will be really old. Here is some information I found regarding the Tesla solar roof shingles. Sounds like they can take up to a class 3 hurricane. Thank you for the additional information. It’s hopeful that any future hurricane will have winds below the 110 mph standards. I just started reading this as we consider buying an existing home or building our own in the same style as you’re describing down in the keys. Seems like modular is the most financially feasible here, given the 180mph wind requirements (expensive structurally) and the (lack of) availability of workforce, etc. I look forward to learning more through your experiences and hear what companies you’ve spoken with about modulars and all that jazz. Thanks for posting! I am adding more blogs posts to “Building Our House in the Florida Keys”. This series covers the problem of our wish list verses budget considerations. As there is additional interest in hurricane resistance home in coastal areas, I am covering wonky topics such as; site work, structural concrete, structural floors and concrete sub-floors. If you are just starting to follow along the first blog posts are archived. If you know of someone who is interested in construction, coastal construction, the Florida Keys, etc please forward this information. If you do not want to receive these notices, please let me know. I built several dozen modular units, both single family and condos in the Myrtle Beach area, all in the hurricane zone. That was several years and hurricanes ago. Fortunately , the mods were still standing when site built units around them were destroyed. There will always be minor siding and shingle damage, but the structural integrity remained intact. Good luck! That is why we are building with ICF forms and concrete! Even the roof will be concrete. Tim Plyler, are you located in the Keys? You’ve got so much knowledge about the challenges. Our tiny ground level place on an ocean side canal in Marathon somehow survived Irma, but we are planning ahead for the eventual need to put in an elevated home…thanks for your input! And Martin, thanks for sharing your journey!! With ICF, in a high wind area, look at Acrylic stucco or brick (or a combination of the two). The acrylic stucco is hard as rock. And in the off chance that it gets penetrated by debris, is still repairable. Brick’s a bit softer (relatively), but bumping the size of your order a bit will provide you with plenty of material to repair any blown-debris damage. And in the mean time, it can serve as ballast for anything stored in the lower level. Thank you for the tip on Acrylic stucco. I’ll investigate it. Brick does not fit with the Florida Keys so we won’t go in that direction. I like the acrylic stucco. Do you have to cover the ICF with the typical stucco sub-structure, chicken wire, multiple scratch coats, etc? Something seems to be wrong with our site. The manager saw a message from you that I did not. As for our progress, wow!!! In June our designer died of a heart attack. His manager did not have access to his computer. The designer’s family refuses to turn over my design work to the designer’s manager! Then, with what we had, we found out our preliminary bids were 50% higher than expected! So we are trying to get our drawings from the family and rethink our design. Considering the following, the hurricane that hit the keys, and the loss of a lot of the work force, steel up 30%, hot economy, etc we are unsure what to do. First we need to get the drawings released. Stay tuned! Whatever choice you make for stucco, remember that any intrusion and entrapment of moisture is a recipe for mold. Add the humid waterfront environment and the chances even higher. Be careful, Mold is a killer! You are certainly better informed than I am. A moisture drainage layer is absolutely required. Thanks for your comments. Our neighbor is building a prefab house. Supposedly they can withstand 180 mph winds. We decided to go with ICF forms and concrete for insulation and hurricane resistance. We too are looking at ICF construction. In talking with the planners at the building department this appears to be a very favorable construction approach in their minds (so it appears to be a good choice on your end). I was wondering if you were able to contact any builders/installers of this type of construction down there? I’ve just started this process but figured I’d tap you to learn what you have learned. “the fear of getting ROGO’ed out of new construction (vacant lot)”. ***Can you explain that to me. We have our lot (never built on) for 12 years and we are close to building, we hope! Our lot is on a canal in Big Pine Key. “ there is no “end” to the permit period” you just need to have an inspection every 180 days to keep the permit “live”. You can also pay to have it extended if needed (at least one time). ***If it is in the county while we are in the City of Marathon, the rules can be different on this matter. We too are looking at ICF construction. In talking with the planners at the building department this appears to be a very favorable construction approach in their minds (so it appears to be a good choice on your end). ***Well the crux of the matter for us is cost vs. safety. Some contractors love it, some contractors think it is overkill. If the difference in temperature from outside to inside is 40 degrees at most, is the extra cost of ICF worth the additional cost? If you were in Maine and the temperature goes from below zero to 90 degrees that change is significant and worth the extra insulation. We have some preliminary proposals but the costs for an ICF house with a concrete roof on piers came in about $200,000 above the alternative of concrete block, foam insulation and 180 mph wood structure roof and metal roofing. Right now we are trying to review our goals and how we get the house we want. We may have to use the concrete block method. I was wondering if you were able to contact any builders/installers of this type of construction down there? ***Contact the ICF Manufacturers Association http://icf-ma.org/. They can give you contractor names by area. We have had our lot for a few years and were going to hold off building for a while but in talking with the ROGO folks last week they are stating that depending on demand, they may only allow permits for new building on new lots though 2023 (5 years from now). Our lot is a Tier 1 lot so we will be able to get a permit, but it appears we’ll want to get our process going sooner than we had hoped due to the pending total amount of new lot permits they will issue. It sounds like you will be putting plans in soon so this shouldn’t be an issue for you if you have a Tier 1 lot. Since we are on Big Pine we have more concern. Once you get a permit to build, if you are “actively building” the permit stays in effect. The definition of actively building is having some (an) inspection every 180 days. We were not planning on doing a concrete roof just ICF for exterior walls. We were planning on wood truss roof with metal roofing not a concrete roof which is too much weight and complicated for the value in our minds. Foundation will be concrete slab on concrete piers. May do poured in place slab with foam ICF forms if we stay with ICF wall…We will probably go with auger piles down 10 to 15 feet. Interior framing will be pressure treated lumber. What contractors have you been talking with and what type of numbers have they been quoting you? Will your lot have a seawall? That is a whole other set of rules and costs. Thanks for asking. Right now we are experiencing some big issues. One our new designer wants to make changes, and we have not decided on which way to go. Also the costs have gone up dramatically due to the hurricane and loss of work force. With continued global warming and hurricanes we are re-evaluating everything.